Tunisia’s No.1 tennis player Malek Jaziri claimed himself a precious spot in the US Open qualifying draw to become the first Arab in three years to try and make it into the main draw at Flushing Meadows. Jaziri is looking to become the first Arab and North African to feature in the US Open since Morocco’s Younes El Aynaoui played his final Open in 2005. The 27-year-old has been consistently rising in the rankings all year with impressive showings in Challenger events in Morocco, Brazil, Russia and Italy. His most recent appearance on the Challenger Tour saw him reach the semi-finals in Astana, Kazakhstan, where he defeated former top-40 Slovak Karol Beck en route propelling himself to a career-high ranking of 226. 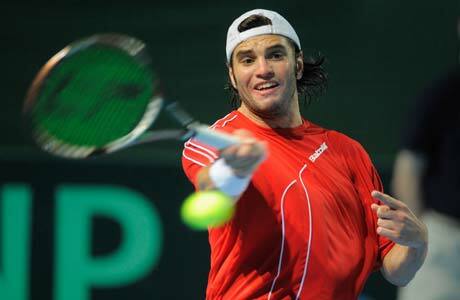 Jaziri made his mark this year when he led the Tunisian squad against Great Britain in the Davis Cup Group II last March. His valiant efforts in all three rubbers of the tie triggered a compliment from Judy Murray, who marvelled at his ability to fight through 13 sets in 51 hours over the weekend in Bolton. Since then, Jaziri won two Futures titles in Newcastle and Manchester, has moved almost 100 spots up the rankings and has made two semi-finals and one quarter-final in Challenger events. He is playing in the Samarkand Challenger this week in Uzbekistan, where he is seeded sixth amongst a strong field headlined by world No.81 Denis Istomin, before he heads to New York for the US Open qualifying tournament that takes place between August 23 and 26.